Magnificent invitation, with a festive gastronomic menu, to an event with Prof. Albert Einstein as the guest of honor in the University of the Republic of Uruguay in Montevideo. Park Hotel, 30.04.1925. The invitation was inscribed and autographed by Prof. Einstein to the Foreign Minister of Uruguay, Dr. Juan Carlos Blanco Acevedo. Freely translated, he wrote: "Souvenir of the wonderful hours we were together." Prof. Einstein's trip to Uruguay in 1925 and his appreciation for its beauty and the quality of its people has become one of the Uruguayan myths that is related with much pride. On 24.04.1925, Einstein arrived from Argentina for a week-long visit in Montevideo, Uruguay. During his trip, Einstein delivered a series of scientific lectures. He was impressed by the country's natural scenery and its buildings, its citizens and its special character, and he noted his experiences in his personal journal. The journal describes Uruguay as a small and happy country with exquisite natural scenery, beautiful weather, hot and damp, and amazing architecture. He was also impressed with the liberality of the country, its socialist laws and its constitution, which was somewhat similar to that of Switzerland. His visit concluded with a magnificent event in his honor at the Park Hotel, arranged by the Uruguayan government and the local university. At the event, he sat next to the president of the Republic Eng. Jose Serrato and the Foreign Minister, enjoying warm conversation with them. 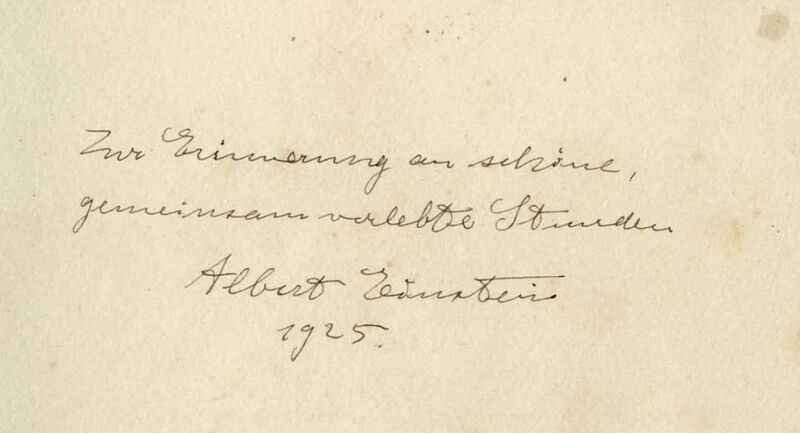 Einstein wrote a personal inscription to the foreign minister on the gourmet menu prepared for the event. Years later, this Foreign Minister headed the Uruguayan delegation to the United Nations that voted for the establishment of the State of Israel on 29.11.1947. On 25.03.2006, this menu was displayed in the halls of the LATU (Laboratorio Tecnológico del Uruguay) in Montevideo, at a prominent international exhibition. double leaf, within a printed jacket binding made of cardboard and tied with a lace. 18x12 cm. Fine-very fine Condition. Minimal aging stains. Traces of tape on the back.